I am on a crusade to get some really terrific and often overlooked informational picture books into the hands of teachers and parents. These books, read aloud to middle and high school students, could be a gateway for important conversations and growth. World-mindedness is an attitude, and an approach to life. It is a sense that our planet is actually a village, and we share this small, precious village with our neighbors. Smith believes that by having a map of the world in our heads, knowing who are our neighbors, where they live and how they live, is a positive first step to living in peace. 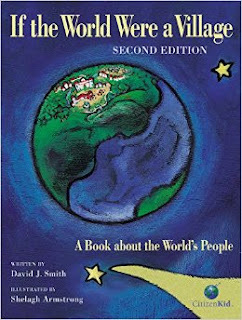 Using the 2002 edition (the book was updated in 2011) Smith asks readers to imagine our planet, with a population of over 6 billion, 200 million (6,200,000,000), as a village made up of 100 people. He then breaks down the village into several topics: nationalities, languages, ages, religions, food, air and water, schooling and literacy, money and possessions, and electricity. The brief text hugs a double-page illustration that relates some very sobering statistics. For example, Air and Water, we learn that 75 people have access to a source of safe water, while the other 25 must spend a large part of each day simple getting safe water. According to Smith, our village in 1900, had a population of 32 people and will increase to nearly 200 in 2050 if the population continues to increase at a rate of 1.6 per year. An author’s note offers many useful tips for teachers and parents on how to incorporate world-mindfulness in your every day conversation with children. A thought-provoking book. A great addition to any social studies class. Other books by Smith include, If America were a Village, This Child Every Child, and I: A Mind-Bending New Way of Looking At Big Ideas and Numbers. Go here to learn more about Smith and his world-mindedness project. Click here to listen to Smith talk about how he came up with the idea for his series of books. 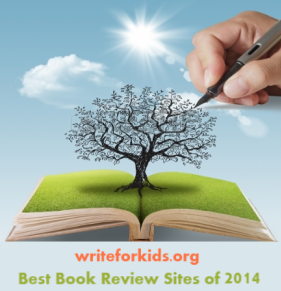 This is a great book to share with teachers and kids.